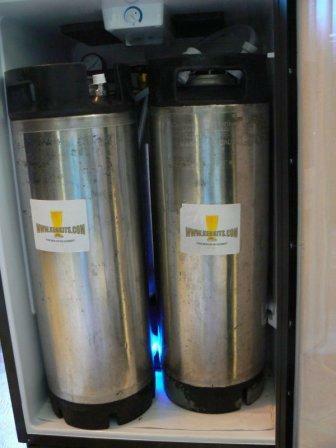 Ever wonder why the first 1/2 beer you pour from your kegerator is warm and foamy? But after your first beer, your beer faucet is so cold that the faucet actually sweats? The answer is really simple. Because warm air naturally rises and cold air naturally sinks, cold air from inside your kegerator can't circulate into the inside of your beer tower without a little help. And the end result is that the beer shank & beer faucet stay at room temperature until you pour a little beer through them. Actually, two things to happen when your faucet & shank stay warm. 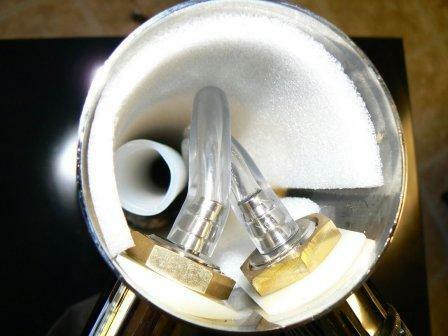 First, CO2 breaks out of the beer inside the shank & faucet and causes bubbles to form. Second, the first ounce or so is warm and the next couple of ounces warm up as they cool off the faucet and shank. I've always advised customers to mount a small fan inside their kegerator in such a way that the fan 1/2 overlaps the beer tower opening - this solution works well. But Eric, a local homebrew club member and customer, took the idea one step further. 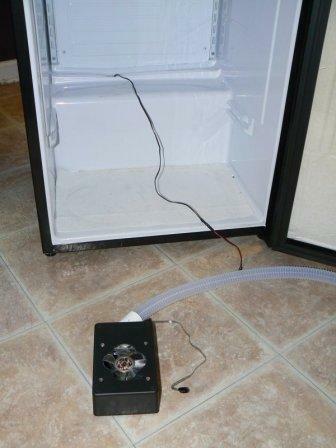 He added a forced air cooler to his Danby Model DAR440BK based mini-fridge 2 keg kegerator and he was nice enough to let me post his instructions on www.kegkits.com. 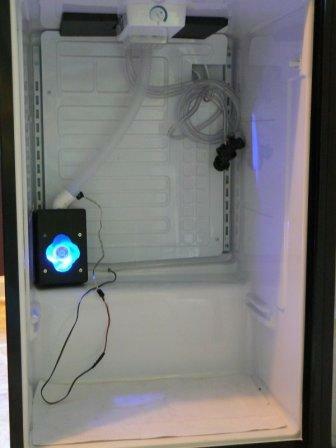 With a little plumbing, the same setup could be used to cool a 2 or 3 tower kegerator with one fan. You'd need to run the hose up from the fan & then tee off a branch for each tower. 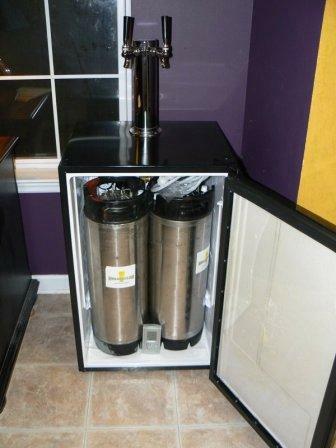 And your kegerator, of course! Place the fan on the front of the box, then use a marker to mark the mounting holes & the center cut-out. Place the 45 degree PVC fitting on the top if the box, then use a marker to mark the outline and cut-out. Open the box & use hand tools to cut openings - the plastic is soft and is easy to cut with a drill and hacksaw. Mount the fan on the inside & route the fan's power plug to the outside of the box. Mount the 45 degree PVC fitting to the top of the box. You can use silicone or white bathtub calk to hold the fitting in place - silicone (any color) really works best. Blue gasket former, sold at most auto parts stores, does not work well. The flexible hose does not need any glue - it should fit tight inside the PVC fitting. Splice the power supply wiring to the fan wiring & test to make sure the fan is pulling air in. 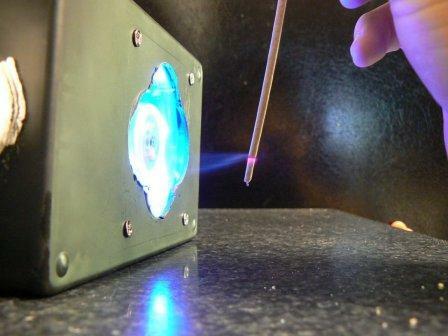 Eric used an incense stick - you can also test with your hand. If the fan is pushing air out, reverse the wiring and test again. 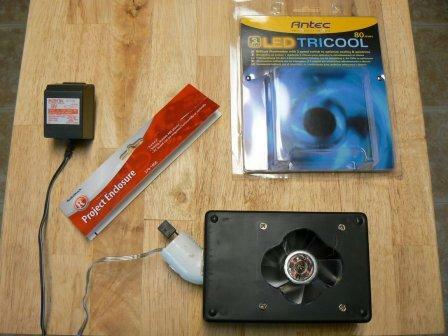 If the fan just hums & does not turn, you bought a AC power supply instead of a DC power supply. Eric also bought the mating power plug from Radio Shack so that he can unplug & replace the fan later. If you don't buy the power plug then you will need to cut the small connector off the end of the fan power cord before splicing. Note the cool blue light. This would look nice in a glass front cooler. Unplug or un-splice the fan connection and run the power in through the drain line. Then re-connect the wires in the same direction they were before. If not sure, just wire & test again. 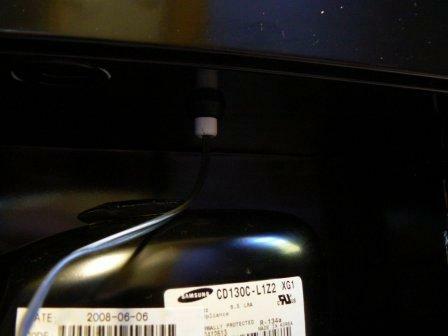 You can see the connector the Eric used on his - this is not necessary but will be convenient if you want to replace the fan later. Here's a picture of the power cord coming in from the back side of the fridge. Trial fit the fan inside the back of the kegerator, route the flexible hose up to the tower, measure and cut. The right length should look like this picture, with the hose sitting at least 1/2 way into the beer tower so that friction between the flexible hose, tower insulation and beer lines can hold the hose in place. If the hose tends to fall out of your beer tower, you can always tape it to the 2 beer lines for suport. Here's a picture looking down from the top and you can see the hose sticking up in the left side. Note: The top of all round beer towers just pops off. And the final product, with the kegs sitting in front of the fan & hose. You can tell its there only because of the cool blue light. One observation that Eric made later - the fan actually cools too well and water condenses on the outside of the tower. But is this really a bad thing? To prevent this, he has started plugging in the fan only when serving beers from his kegerator. I believe a better solution would be to wire a cut-off extension cord end or outlet in a box into the thermostat circuit and then to plug the fan power supply into the outlet. If done right, the fan will come on whenever the kegerator turns on. But to do this, you need to understand more about how the kegerator is wired and there are too many brands and models out there to include wiring directions for each one in these instructions.